Today's most notable Premier League matchup was between Tottenham Hotspur, currently third in the table with just two points over Chelsea, and eighth-place Liverpool FC. This game was vital. A week after beating bitter rivals Arsenal, Spurs are trying to get some separation from Chelsea, while a surging Liverpool need a good string of results if they're to qualify for Europe again next year. Liverpool started off comfortably and gained the lead after 21 minutes when Jose Enrique played a cheeky through ball behind the Spurs defense to Premier League leading scorer Luis Suarez, who tapped the ball around goalkeeper Hugo Lloris for the goal (more on Lloris anon). But Tottenham controlled from there, and it was Belgian centerback Jan Vertonghen who finally broke through for the Spurs, scoring on a header from Gareth Bale just before halftime and again with a left-footed volley in the 53rd minute to give his team the lead. For a short while, Tottenham looked the better side. And then Kyle Walker and Hugo Lloris and happened. On the right flank near midfield, Walker took a short pass from centerback Michael Dawson and tried to play it with his first touch to Vertonghen, who had no one behind him. But Walker's pass was absolutely despicable, and he sent the ball skying over his teammate's head into the path of Liverpool's Stewart Downing. It's cool, though, because in theory, at least, that's what goalkeepers are for. Lloris alertly rushed out of his box to volley the bouncing ball out of bounds. It seemed like a pretty routine clearance, until he missed nearly the entire ball, taking himself completely out of position and leaving Stewart Downing in on goal with no one but a defenseless Michael Dawson He powered it through Dawson's legs to make it 2-2. The score remained the same until the 82nd minute when Jermain Defoe and Benoit Assou-Ekotto happened. Lloris punched a Liverpool freekick out of danger, until Defoe took the ball onto his chest and then accidentally kicked it 15 yards back into his box, in the path of Luis Suarez. Luckily Assou-Ekotto was there just in time to turn his back to the ball and throw his body into Suarez's who collapsed in a heap inside the 18-yard box for a penalty kick. 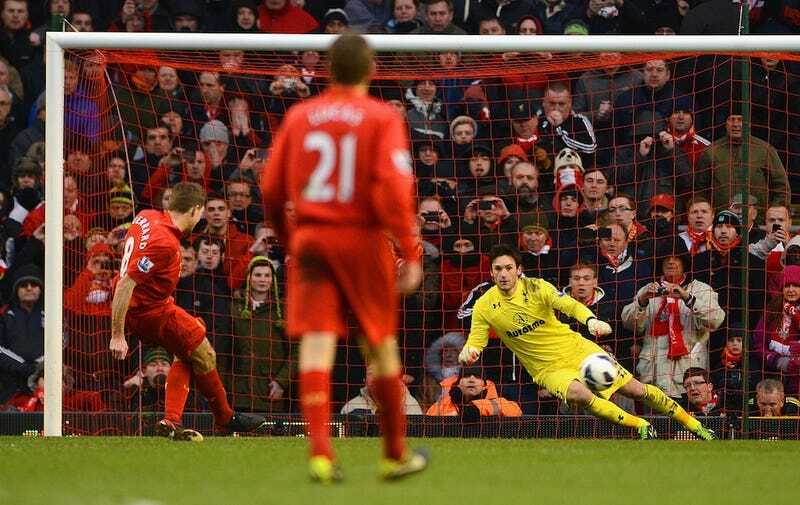 Seconds later, Liverpool captain Steven Gerrard scored from 12 yards out to put his team ahead for good, 3-2. With the win, Liverpool moved to sixth place in front of Everton, who are without injured goalkeeper Tim Howard, and West Brom. While Tottenham's currently sitting in third, Manchester City as well as fourth-place Chelsea and Arsenal, fifth, all have a game in hand. If you're surprised, don't be. This is what the Spurs do.